Rich Products of Vineland, N.J., is recalling approximately 3,420 pounds of beef meatballs that may be adulterated with Listeria monocytogenes. 36-lb. cases containing six 6-lb. 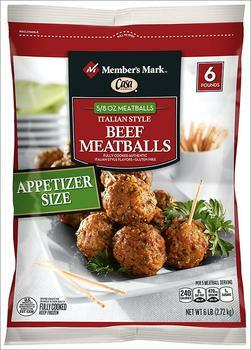 bags of “Member’s Mark Casa DI BERTACCHI ITALIAN STYLE BEEF MEATBALLS” with a “Best if Used By 17 DEC 2018” label and a lot code of 15507351 on the packaging. The the recalled products, bearing establishment number “EST. 5336” inside the USDA mark of inspection, were shipped to distributors in Alabama, Florida, Louisiana, Mississippi, North Carolina, South Carolina, Tennessee, Texas and Virginia. Consumers with questions regarding the recall may contact Rich Products customer care at 1-800-356-7094.